We are a locally owned and operated business since 2006. A+ rating with the Boston BBB Since 2007. Proud Member of Boston North Business Chamber. Low Overhead. No greedy stockholders here! GSA Government Contractor Since 2007. Guaranteed Lowest Shredding Rates. 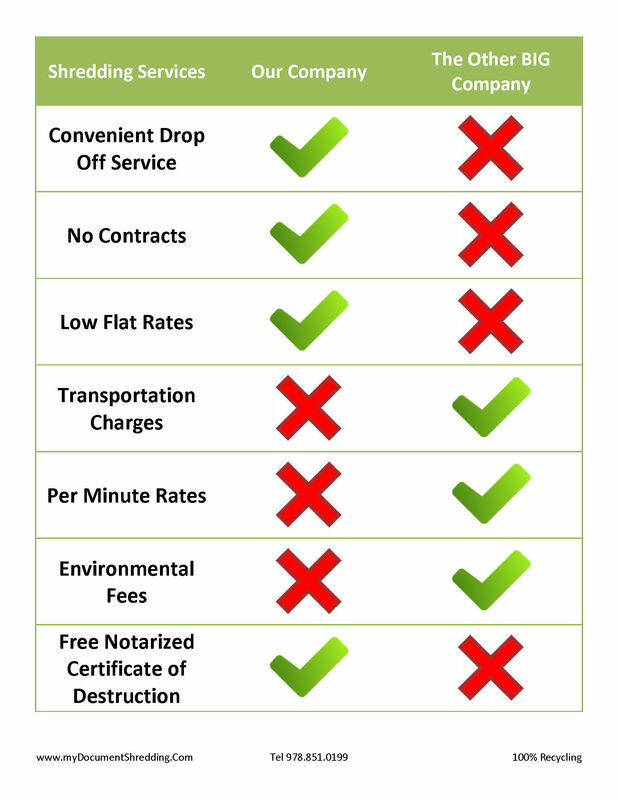 Our Rates Are Here. NO Contracts And No Minimums. We handle document shredding service for a variety of businesses: Doctors, Lawyers, Accountants and businesses looking for annual, quarterly or a one-time clean out, in addition to our loyal residential customers who love the service and our low rates. Join our long list of happy customers today: we are one phone call away (978)636-0301. Secure document shredding and hard drive destruction in the Boston, Massachusetts area is easy with Neighborhood Parcel. One call to 978-636-0301 is all it takes to have your confidential documents destroyed right away. Our staff will explain our service options and answer all your questions so you can choose the best option for your shredding service needs. Why trust your sensitive documents to a teenager at FedEx Office, UPS store or Staples, when you can hire the best local shredding service and save time and money!